This entry was posted on Friday, February 8th, 2013 at 7:32 pm	and is filed under . You can follow any responses to this entry through the RSS 2.0 feed. You can leave a response, or trackback from your own site. 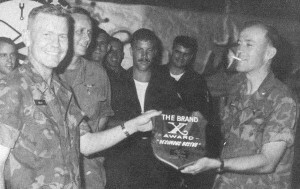 This photo shows VMFA 314’s Skipper (LtCol Tom Kelly) and XO (Maj. Bob Johnson) presenting the coveted “Second Best” Award to VMFA 122 CO (Whose name unfortunately has slipped behind the curtain of time). 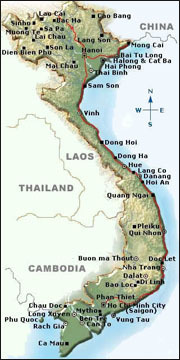 The locale was the air group’s club and the date would have been somewhere around April 1970. Correction – That is my father, LtCol Tom Kelly, on the left. He passed in 2003. He was especially proud of the men he served with in the 314. Hoping you are successful in bringing Jerry home. Brian — thanks so much for the heads up and the nice comment about our quest to bring home Jerry’s remains. I corrected your dad’s name in John’s comment — your dad was obviously a great leader with a sense of humor. The photo says it all.